We arrived Friday around 6pm to Tivat airport on the coast here in Montenegro, just about a 15 minute drive from our temporary home in the fishing village of Muo, near Kotor. Our apartment landlord picked us up right at the airport and after a quick drive we had our first glimpse of our new temporary home. The pics of the view on AirBnB looked amazing, but seriously, you can’t capture this view in a picture. Not only is it a perfect view of Kotor bay, the entire town of Kotor, you get the majestic backdrop of the Fjord behind the town. Truly awe-inspiring each time. Over the weekend we checked out some restaurants in town and had some always delicious pizza, Cevap (of course) and a new type of Cevap I’ve never had before –Uštipci, a tasty mix of pork, some cheese and a spicy flavor. After noticing after the first night that the music doesn’t stop until 1am, we figured if you can’t beat them, join them, so we headed out to Klub Maximus for a techno-filled club experience that reminded me I am 35. We will have to visit again on a night that isn’t 100% techno only – some diversity in the music would have been nice as it was an awesome venue! It was an “Anonymous” party as well, so everyone in the venue was wearing Guy Fawkes masks, which made me feel like I was in an underground Berlin hacker convention or something – pretty hilarious. The water of the bay is delightfully warm, seriously, I am the biggest baby with swimming in cold water and if the dock was a bit deeper I would jump straight in here! You can swim in the mill-pond still bay with the view of the Fjords and the cruise ships for hours, it’s just perfect. I really think we couldn’t have picked a better place to base ourselves to start this trip. Last night we fired up the grill that our hosts purchased for us when we asked if there was a grill, and it was a fun learning experience. We acquired some sort of wood based charcoal for the grill that was un-like anything I’ve worked with before. Once I realized that I had to keep stoking more and more of it on the grill to keep it hot, however, it yielded a delicious meal of grilled chicken and grilled cabbage. Even the view from the grill is good – we are spoiled. Met our upstairs neighbors, a Romanian couple who came out to share the grill and cook some Pljeskavica which looked pretty damn tasty. Today was the day for errands – even paradise has those I’ve learned 🙂 While our apartment has “internet” – the speeds left a bit to be desired. Since we are relying on the connection to make calls via the internet and book our future travels and such, we knew we needed to find an upgrade. Thankfully T-Mobile Montenegro hooked me up with a remarkable deal when I went into town today – a USB dongle with 15GB high-speed internet for a month for 25 Euro. Not only that, but we get to keep the dongle so we can use it in other countries, so really the internet only cost 6 Euro. Sort of amazing and will be perfect to stay in touch. The helpful girls in the shop quickly showed me how to turn my Windows Tablet into a hotspot and now we have our own virtual network for the apartment. Remember my post earlier about how travelling has changed with technology? Seriously, this is a far crazy from the days I stood on the street in Zizkov, Prague to make calls on an antiquated pay-phone, and for less cost! We’ve already started to slip into the relaxed Montenegrin way of life….. afternoons swimming, days spent planning the next fresh items to pick up at the market to cook for our meal, nights spent enjoying the remarkably good Vrnac red wine which at 2 euro a liter puts 2 buck chuck to absolute shame. In the days ahead we will adventure out to the other towns of the Boka Kotorska — Perast, Risan, etc and start doing some more active pursuits around the area. 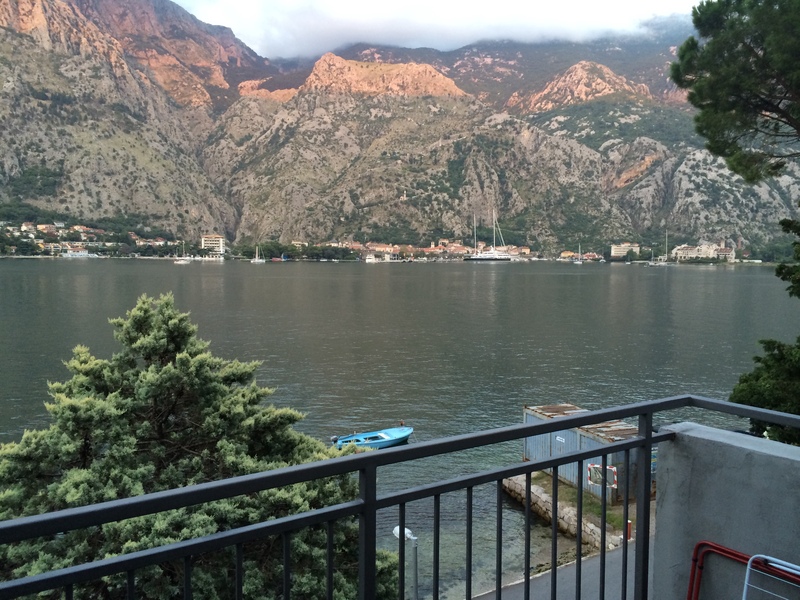 This entry was posted in Montenegro, The Journey and tagged Kotor, Montenegro. Bookmark the permalink. Nice, detailed first report, Alex! 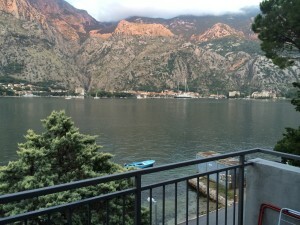 Your post makes me want to make a return visit to Montengro, re-visit Kotor and see more of the country as well. Have fun, enjoy your long stay in the region, and save me some cevapcici!